IISD Reporting Services (IISD RS) has produced daily web coverage, daily reports, and a summary and analysis of this meeting. To download our reports, kindly click the HTML or PDF icons below. The twenty-fifth Meeting of the Parties to the Montreal Protocol (MOP25) convened for its final day on Friday, 25 October, in Bangkok, Thailand. In the morning, the high-level segment reconvened to finish hearing statements from heads of delegations. During the morning and afternoon, the contact groups on ODS alternatives, and on terms of reference (TOR) for the study on the 2015-2017 replenishment of the multilateral fund (MLF), met to conclude their work. In the afternoon, the preparatory segment plenary reconvened to hear report backs on outstanding agenda items. It concluded discussions on the critical-use nominations Handbook on Methyl Bromide, the harmonization and the validation of the MLF climate indicator. The contact groups on the TOR for the study on the 2015-2017 MLF replenishment and on ODS alternatives requested additional time for further negotiations. Plenary was adjourned pending conclusion of these two contact groups. The preparatory segment of plenary resumed at 8:13pm, and the high-level segment at 8:36pm. 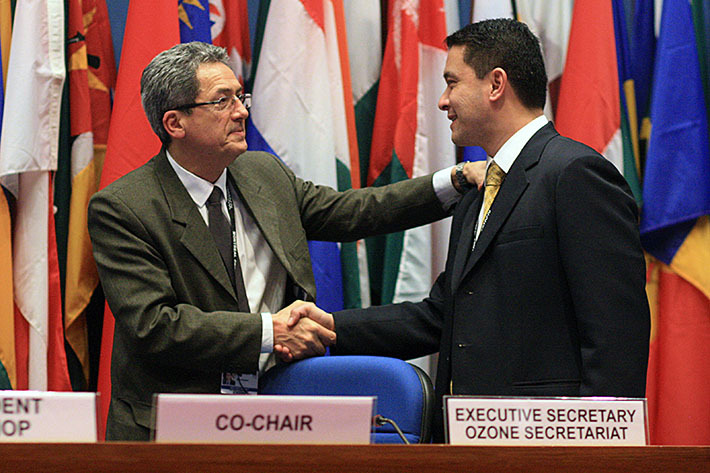 Delegates adopted decisions and the report of the meeting, and offered tributes to Outgoing Executive Secretary Marco González for his tireless efforts and leadership at the Ozone Secretariat. MOP25 Vice-President Malcolm Craig McKee, New Zealand, closed the meeting at 10:00pm. Outgoing Executive Secretary Marco González, Costa Rica, thanked Rapporteur Juan Miguel Cuna, the Philippines, after the close of the meeting. Tairite George Kwong, Minister for Environment, Lands and Agriculture Development, Kiribati. Martin Tako, Deputy Minister, South Sudan. Eng Tiang Sing, Director, International Policy, Minister of the Environment and Water Resources, Singapore. Ana Maria Contreras Vigil, Director-General of Air Quality Management, Mexico. Didier Coulomb, Director, International Institute of Refrigeration. Moncef Sliti, Chief of Staff, Ministry of Public Works and Environment, Tunisia. Tjekero Tweya, Deputy Minister of Trade and Industry, Namibia. Khatuna Gogaladze, Minister of Environment, Georgia. Jeem Lippwe, Deputy Permanent Representative, Federated States of Micronesia. A view of the dais during plenary. Antonio Asuncion Oposa, Federated States of Micronesia. Gudi Elisabeth Alkemade, the Netherlands. Preparatory Segment Co-Chair Javier Ernesto Camargo, Colombia. MOP25 Vice-President Malcolm Craig McKee, New Zealand. The contact group on the TOR for the study on the 2015-2017 replenishment of the MLF met throughout the day and evening. The contact group on alternatives to ozone depleting substances met throughout the day and evening. UNEP OzonAction presented a lunchtime side event on the phase-out of HCFC in the refrigeration and air conditioning sector, and launched capacity-building tools. The MOP25 Bureau met before plenary. Outgoing Executive Secretary Marco González, Costa Rica, with delegates from Singapore and Fiji. The outgoing Executive Secretary with your Earth Negotiations Bulletin MOP25 team (L-R): Dan Birchall, Digital Editor, United States; Nicole de Paula Domingos, Writer, Brazil; Marco González, Executive Secretary of the Ozone Secretariat, Costa Rica; Asheline Appleton, Writer, Kenya; Kate Louw, Team Leader, South Africa; Brett Wertz, Writer, United States.